The new Yankee Stadium opened in 2009, and there have been plenty of memorable moments during its first five years. From the Yankees capturing their 27th World Series title in 2009 to Derek Jeter joining the elite 3,000 hit club in 2011, here's a countdown of the top 10 greatest moments at the new Yankee Stadium -- so far. 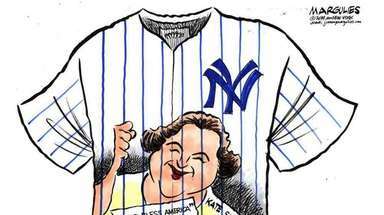 July 16, 2010 was the Yankees first home game since the death of owner George Steinbrenner. Derek Jeter gave a moving speech at home plate before the game started, and the jumbo television in centerfield played Steinbrenner tributes between innings. With two outs and one on in the bottom of the ninth and the score tied at four, Nick Swisher hit a walk-off RBI single to give the Yankees a 5-4 win over the Tampa Bay Rays. Down 3-2 to the Anaheim Angels in the bottom of the 11th of Game 2 of the American League Championship Series on Oct. 17, 2009, Alex Rodriguez hit a leadoff, game-tying solo home run off Angels closer Brian Fuentes. The Yankees went on to win 4-3 and take a 2-0 series lead. Derek Jeter singled in the third inning against Baltimore Orioles pitcher Chris Tillman on Sept. 11, 2009 for hit number 2,722, moving him past Lou Gehrig and breaking the Yankees' all-time hit record. With the ALDS against the Baltimore Orioles tied at 1-1 and the Orioles leading Game 3 by a run with one out in the ninth, Raul Ibanez was sent in to pinch-hit for the struggling Alex Rodriguez. It was an unprecedented move given Rodriguez's stature as one of the greatest sluggers in baseball history. But Ibanez made manager Joe Girardi look brilliant, hitting a home run to right field to tie the score. In the bottom of the 12th, Ibanez struck again, turning on the first pitch of his next at-bat to win the game. New York Yankees pitcher Mariano Rivera leaves the field for the last time as a player at the close of his last game at Yankee Stadium on Sept. 26, 2013. With two outs left in the ninth and the Yankees up 2-1 on the Houston Astros, Derek Jeter and Andy Pettitte emerged from the dugout to take Rivera out of the game. Down 3-1 to the Minnesota Twins in the bottom of the ninth of Game 2 of the American League Division Series on Oct. 9, 2009, Alex Rodriguez hit a one-out, two-run game-tying home run off Twins closer Joe Nathan to send the game into extra innings. In the 11th inning, Mark Teixeira hit a solo, walk-off home run to give the Yankees a 4-3 win and a 2-0 series lead. On Nov. 4, 2009, Hideki Matsui exploded in Game 6 of the 2009 World Series, going 3-for-4 with 6 RBIs to lead the Yankees to a 7-3 win over the Philadelphia Phillies and their 27th World Series title. Matsui's heroics helped earn him World Series Most Valuable Player. Mariano Rivera set the Major League Baseball all-time saves record with save No. 602 on Sept. 19, 2011. The save gave the Yankees a 6-4 win over the Minnesota Twins. Derek Jeter hit a home run off Tampa Bay Rays pitcher David Price for his 3,000th career hit on July 9, 2011. Jeter became the first Yankee in franchise history to amass 3,000 hits. He also went 5-for-5 with the game-winning RBI single to lead the Yankees to a 5-4 win. The New York Yankees won their 27th World Series championship on Nov. 4, 2009 after defeating the Philadelphia Phillies in six games.